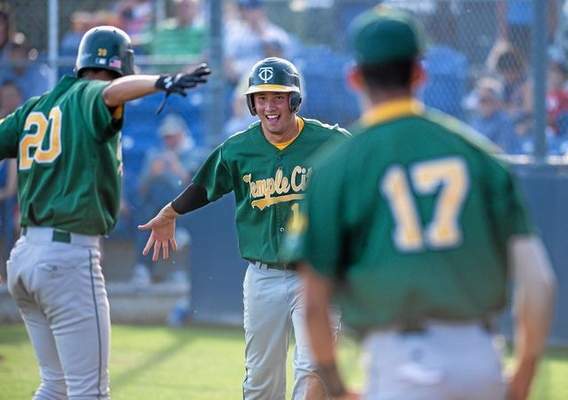 TEMPLE CITY >> No lead, apparently how big, is safe in the Rio Hondo League this baseball season. Monrovia High School proved that point on Thursday afternoon. The Wildcats scored six times in the top of the seventh inning to defeat Temple City, 8-6. Maranatha 8, Pasadena 5 — Kellie Natham went 2 for 2 with two RBIs and a homer, Caroline Diehl went 2 for 3 with three RBIs and Grace Rose went 2 for 4 with a double to lead the Minutemen (5-4) to the nonleague win. Also, for Maranatha Karen Lieng went 2 for 4 with a double and two runs scored, Caroline Sommers had a double and Michelle Lieng had a triple. Noel Villalobos pitched a complete game, Melissa Cortez hit a home run and Sophia Courtney had a triple for Pasadena. Monrovia 11, Temple City 6 — Vicky Gutierrez went 3 for 3 with three runs scored, Tanya Galvan had three RBIs and Brooke Mann had a double to lead the Wildcats (7-3, 3-0) to the Rio Hondo League victory. Also contributing to Monrovia’s win were Alyssa Salva and Alyssa Mendoza who each had two hits. Juliette Marini had two hits with three runs scored and Sierra Singer had two hits to for Temple City (3-6, 1-1). Carter 6, Pasadena 4 — Jacob Stetchel, Frankie Garriola and Sumner Smith each drove in a run in a four-run fifth inning, but the Bulldogs (5-5) fell short at the Cougar Classic. La Salle 197, Cathedral 257 — Tyler Anastasia and Jesse Toribio shared medalist honors, shooting 2-over 38s at Brookside No. 2, to lead the Lancers (9-0, 2-0) to a Camino Real League win over Cathedral (5-3, 1-1). La Salle’s Sean Kelly finished a shot behind in third. Pasadena 114, Hoover 55 — Mia Hepner won the 200 IM (2:18.05) and the 500 freestyle (5:36.47), and Shannon Brierty claimed the 50 freestyle (27.24) and the 100 freestyle (59.41), leading the Bulldogs (3-1, 1-1) to a Pacific League victory. Pasadena 86, Hoover 83 — The Bulldogs (3-1, 1-1) edged Hoover in the Pacific League meet behind a double-win by Matt Klein, who was first in the 50 freestyle (24.45) and 100 freestle (54.81). Temple City 12, Maranatha 6 — Teams of Spencer Chen and Jun Yu and Alec Mejia and Justin Lee swept in doubles for the Rams (7-3) in a nonleague win. Matthew Alleman swept in singles for Maranatha (5-3). Pasadena 140, Duarte 21 — Michaela Salinas won both the 200 freestyle (2 minutes, 14.26 seconds) and the 100 backstroke (1:11.45), Shannon Brierty won the 50 freestyle (27.55) and the 100 freestyle (1:02.57), Madeline Lepesant won the 200 IM (2:29.80) and the 100 butterfly (1:03.37) and Mia Hepner won both the 500 freestyle (5:28.69) and the 100 breaststroke (1:17.90) to lead the Bulldogs (2-1) to the nonleague win. The Bulldogs also won the 200 medley relay, 200 free relay and the 400 free relay. Pasadena 138, Duarte 28 — Jamaal Amiryin-Clipps won the 200 IM (2:26.84) and the 100 breaststroke (1:12.78), Chance Woods won the 50 freestyle (23.61) and the 100 freestyle (51.75) and Ian Iverson Villanueva won the 500 freestyle (5:44.26) and 100 backstroke (1:12.04) for the Bulldogs (2-1) in a nonleague win. Ashford Mine won the 200 freestyle (2:08.19) and Cody Kalenderian won the 100 butterfly (1:05.44) for Pasadena. The Bulldogs also won the 200 medley relay, 200 free relay and the 400 free relay. 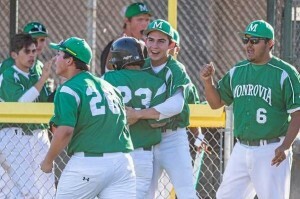 SAN MARINO >> Zech Jarrard was peering onto the San Marino High School baseball field with a Yogi Berra-like grin. The Temple City center fielder did not bring up Berra’s famous line, “It’s not over until it’s over.” But he was definitely believing, and smiling, about it. 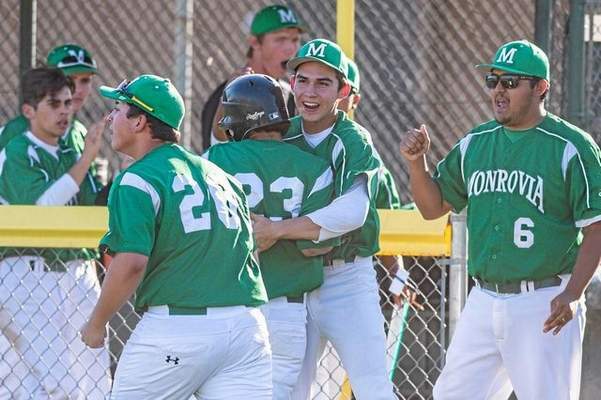 The junior drove in the winning run with a squeeze bunt in the seventh inning to help the visiting Rams to a 4-1 victory over San Marino in a Rio Hondo League opener Friday afternoon.